A man with terminal motor neurone disease is bringing a judicial review which could result in a change to the law on assisted dying. 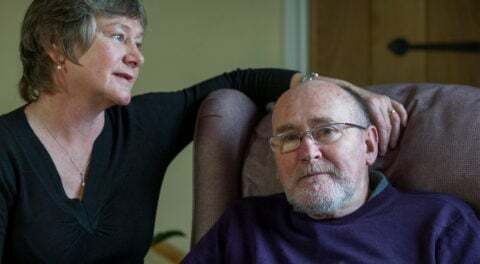 Noel Conway, a man with motor neurone disease who seeks the choice and ability to die with dignity, has been supported by Dignity in Dying to instruct lawyers at Irwin Mitchell to seek a judicial review. A man with terminal motor neurone disease is bringing a judicial review which could result in a change to the law on assisted dying to allow terminally ill adults who meet strict criteria to make their own decisions about ending their lives. Before his illness Noel enjoyed hiking, cycling and travelling but his deteriorating condition means that his ability to move, dress, eat and deal with personal care independently has diminished considerably. Noel is also dependent on a ventilator to breathe overnight, as his breathing muscles continue to weaken. The retired social sciences lecturer and adult education teacher is married with a son, daughter, stepson and grandchild. Noel feels that he is prevented from exercising his right to choice and control over his death under the current law and that he is instead forced to suffer against his wishes. Noel is bringing this case to fight for his right to have the option of an assisted death when he is in his final six months of life. “I have motor neurone disease. It is incurable and terminal. It is a muscle wasting disease and I am now heading for its final stages when I face not being able to move at all. This prospect is terrifying and the amount of suffering unimaginable. Current law means that I will have no control of how my life ends and I will have to endure this nightmare for as long as it takes. As someone who has always been in control of his life and taking responsibility for himself, I find this quite unacceptable. I want to change the law to allow assisted dying so that I can be in control of my own death. “If I let nature take its course, I could effectively become entombed in my own body as my ability to move and communicate continues to diminish, or I may die by suffocation or choking. I could bring about my death by refusing my ventilator, but then there is the unbearable uncertainty of not knowing how long it would take and no guarantee that my distress and pain could be adequately managed. I have considered travelling to Dignitas in Switzerland to have an assisted death but this is expensive and requires a lengthy journey which in my current condition I may not be able to make anyway. I do not wish to die far away from my home and without my loved ones around me. Noel is a member of the organisation Dignity in Dying, which is supporting the case. Dignity in Dying campaigns for everyone to have the right to a good death, including the option of assisted dying for terminally ill, adults with mental competence – something supported by 82% of the population1. Noel, supported by Dignity in Dying, has instructed specialist public law experts at law firm Irwin Mitchell to seek permission for a Judicial Review on the grounds that the current laws contained in the Suicide Act 1961 are incompatible with Noel’s basic rights – to be able to die with dignity. The law firm has issued proceedings in the High Court and hopes that a full hearing will take place in early 2017. The case will present evidence on the eligibility criteria and safeguards that could form part of a workable legal framework on assisted dying. “Instead of being shown compassion and kindness, Noel is facing his final months with a dire set of options that most people would find completely unacceptable. “Noel’s experience sadly echoes that of hundreds of other terminally ill people in this country. Choice and control at the end of life are rights that everyone should be able to exercise and it is a tragic failure of our laws that Noel and others are being denied them. “Despite overwhelming public support for assisted dying, our Government has failed to act and is ignoring the pleas of terminally ill people. Britain is being left behind as jurisdictions around the world implement compassionate laws allowing dying people the choice and control they deserve. Yogi Amin, partner and head of public law at Irwin Mitchell, added: “Noel is an extremely brave and proud man who is supported by his loving family. He would like the choice to be able to die with dignity. The world has changed phenomenally in the past few decades with many medical advances but the law on assisted dying for those who are terminally ill hasn’t changed for more than 50 years. If permission is given the full hearing in the High Court is likely to take place in early 2017. The case is between Noel Conway and the Ministry of Justice. Papers have been issued and the next stage is for the courts to decide whether the case should get permission to proceed. If permission is granted, there would be a full hearing of the case in the High Court. A case brought by Tony Nicklinson who suffered from paralysis after a stroke was ultimately dismissed by the Supreme Court in 2014, with judges stating that it was important Parliament debated the issues before any decision to change the law was made by the courts. a High Court judge could be asked to confirm the criteria has been met. Following developments this year, six states in the USA are covered by assisted dying legislation. On the 9th of June 2016 California implemented the End of Life Options Act, which was signed into law on the 11th of September 2015, the same day that an Assisted Dying Bill was defeated in the UK’s House of Commons. On the 8th of November 2016 the people of Colorado voted in favour of implementing a similar Act. On the 15th of November 2016 the Council of the District of Columbia approved its own assisted dying Bill. The Mayor must now vote on whether to approve it. Canada passed legislation on the 18th of June 2016 which allows adults with a serious and incurable disease in enduring and intolerable suffering to request an assisted death. Irwin Mitchell is over 100 years old and is one of the largest law firms in the UK. Last year Irwin Mitchell merged with Thomas Eggar LLP expanding its presence in London and the South East and has also acquired specialist Personal Injury firm MPH Solicitors and private wealth firm Berkeley Law in the past few years. The firm is ranked as a market-leading personal legal services firm in the independent Legal 500 and Chambers UK guides to UK law with over 100 lawyers personally recommended.